The War Game is one of television’s most notorious banned programmes. 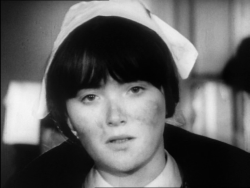 A harrowing dramatised documentary portraying the after-effects of nuclear holocaust and calling for public education in nuclear deterrent policy, it was made by the BBC for 1965 broadcast but was not transmitted for twenty years. 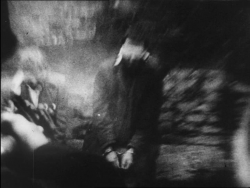 Among the reasons given for the ban were its brutally graphic scenes, its apparent left-wing bias and its controversial fusion of journalistic fact and hugely alarmist fiction, although there is now evidence that it fell victim to the political suppression of nuclear discussion that was happening at the time across all media. Its director, Peter Watkins, quit the BBC and fought to get it a cinema release abroad, resulting in critical acclaim and a Best Documentary Oscar. After its eventual transmission in 1985, critics agreed that the BBC had suppressed one of the greatest dramas ever made. That The War Game got made at all testifies to the reputation that Watkins had acquired at the BBC. After making a number of short films including The Forgotten Faces (1961), an award-winning portrayal of the 1956 Hungarian uprising, he made a brilliant BBC debut with Culloden (1964)2. This dramatisation of the Battle of Culloden in 1746 and the genocide of the Highland Scots that followed was shot as if a news crew had been present at the time, a stunning intermingling of drama and documentary made – like The War Game – by the documentary department. Although Culloden was controversial, it won Watkins a British Screen Writers Guild award and much critical acclaim hailing a true television pioneer. Drama-documentary has long been a controversial genre, because of the common, simplistic, view that it blurs the ‘truth’ of documentary with the ‘lie’ of fiction3. Rather than being simply the ‘truth’, documentaries are shaped by their maker’s opinions, choice of subject, camera placement, editing, the subject’s response to being filmed or, according to theoretical readings, the inevitable narrative structures of documentary (which is itself subject to fictive construction rather than inherently ‘objective’) or even history. A conflation of journalistic research and dramatic staging that combines factual statements with events that provoke emotional responses4, The War Game is hard to categorise. Perhaps his style owes a lot to Humphrey Jennings, who during the Second World War developed reconstruction dramas with documentary techniques and the innovative use of non-actors, in particular in his only full-length feature, Fires Were Started(1943). The most striking connection is that between The War Game and Jennings’s The Silent Village (1943), a fictionalised version of Nazi atrocities against the Czech population of Lidice after the assassination of Heydrich. The Silent Village begins as a documentary observing the minutiae of everyday life in a Welsh village, but then changes as it dramatizes Nazi invasion and reprisals for acts of resistance. An attempt to bring Nazi atrocities closer to home, The Silent Village pioneers a style which Peter Watkins develops with immense power. Like The Silent Village, The War Game is primarily a ‘documentary film’ – it calls itself this in the credits, and Watkins strives to make it viable as such. It has a serious voice-over by then-newsreader Michael Aspel. It supports its hypotheses with Watkins’s vast research, with quotes from cited sources, including NATO briefings and American strategists. Just three years on from the Cuban missile crisis, it contextualises the outbreak of war in the Cold War climate, with the East-West divide in Berlin providing the flashpoint. Using documented knowledge of national emergency provisions, the film includes the devolution of power to fifteen regional commissions and local committees. Using government estimates, it demonstrates the potential difficulties of evacuating all except able-bodied male adults, and enforced billeting (along with other social tensions, such as the awkward moment when one woman asks, ‘Are they coloured?’). The portrayal of the nuclear blast has a sound scientific grounding in all its stages, from shock front to firestorm, although it is melodramatically described as ‘an enormous door slamming in the depths of Hell’. It is not until after the bomb has dropped that fact is replaced by hypothesis presented as fact (though these are based on documented experiences in bombed cities like Hiroshima, Hamburg and Dresden). It is a masterpiece of technique. It has a documentary feel, with hand-held cameras and real sound (with chilling use of effects and, often more chillingly, silence). Watkins employs vox pops with the man-and-woman-in-the-street. We are given locations, dates, prices, names, and a massive amount of detail to add verisimilitude. We are told that ‘such scenes as these would be almost inevitable’, but this hypothetical quality to these fictional scenes is a problem. If a certain number of devices are launched, if a certain number of people are wounded, if these wounds are of a certain severity, if the hospitals cannot meet the demand, if there is a policy of leaving the wounded to die untreated in holding sections, and if these victims reach a certain number, then we may see armed bobbies putting them out of their misery. It is possible – even probable – but the production techniques suggest an acceptance of such hypotheses as fact. Scenes of intense human suffering are shot like news footage, with all-too-familiar sequences of corpses and a camera being pushed in the faces of the shocked, charred and mutilated. The film was so realistic that Grace Wyndham Goldie, former head of BBC Talks and Current Affairs (who had worked with Watkins on Culloden) alleged that Watkins underfed the cast and used such gimmicks as tripwires, which everyone involved vociferously denied5. The soundtrack features unseen women and children crying, which, combined with tight close-ups during scenes of mass devastation, encourages us to use our imaginations. And this is the important point – it may feel as though a detached camera crew are wandering around chaotic scenes, but every second was meticulously scripted, down to the inarticulate ‘uhs’ of those in pain. Despite its dramatic techniques, it is presented as journalism. Chillingly detached voiceovers counterpoint the often-traumatic portrayal of acute hysteria. An unseen reporter is denied access to a room in which bodies are being burned. 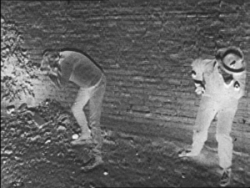 The camera reacts to events, often in shock: in a firing squad scene, the shots are accompanied by a violent shocked camera judder, on which Watkins freeze-frames, capturing the aesthetic of photo-reportage. 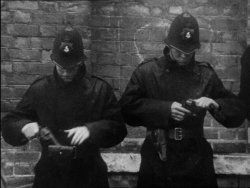 However, although scenes like this are in themselves gruesome, it is the context which causes problems, as Watkins dwells on the (seemingly inevitable) breakdown in social order. Indeed, there are various subtexts which prove that The War Game is about more than nuclear war. One aspect, which would have been particularly striking at the time, is the subtext criticising Britain’s conduct in the Second World War. Despite its futuristic atomic background, The War Game features much Second World War imagery, with evacuations, rationing and rubble. The suffering, we are told, is based on events in Hamburg and Dresden (bombed by the Allies) and Hiroshima (nuclear-bombed by the United States). When bodies are burned, we are reminded that ‘Everything you are now seeing happened in Germany after the heavy bombing in the last war’. We are told that the Allies might fire first, and then see vox pops with members of the public who are shocked by the idea. Before the bomb falls, there is a move towards profiteering and black marketeering which makes many incapable of surviving (arguably connecting the bomb with capitalism). At the time, the Evening Standard summed up a major area of complaint, arguing that ‘While the presentation seems authoritative, the film is straight propaganda for the Campaign for Nuclear Disarmament’6. Watkins uses interviews to put across his wider pacifist message. The Atomic Age and the Stone Age are said to be the same, as the bomb is compared with the Aztecs who sacrificed thousands to their Gods to maintain the status quo. The film’s subsequent portrayal of regression to barbarism fits in with the famous statement of an American officer that America could bomb Russia ‘back to the Stone Age’. Vox pops in which people maintain that we should stand up for ourselves and bomb Russia back (‘a vicious circle’) would fit an earlier era of war, but not this one. The ‘deterrent’ idea inherent in the policy of Mutually Assured Destruction (whose acronym, of course, was MAD) is shown to make escalation inevitable, as having a nuclear stockpile makes it imperative to hit before you get hit. Watkins makes the audience complicit with nuclear war: an intellectual tells us that, if voters give power to a government that does this, we must ‘accept the moral responsibility’. This is a dangerously political (in the sense of potentially influencing votes) message that connects as an experience through the use of drama documentary technique. By stating that this could happen to its audience (before 1980, it claims), the film wants to scare its audience out of complacency, to get them to ask questions, to make their voices heard in a world on the brink of self-imposed destruction. As a drama documentary, it had and has the power to move an audience which could possibly not be matched by the use of cold, hard facts (although this should not underestimate the power of documentary). Indeed, statistical thinking is the cause of the madness: an American strategist coolly predicts a pause for governments to plan World Wars Four thru Eight. Another element in the banning of the film is its treatment of the Church. Captions quote statements from an Ecumenical Council meeting, showing that the Church would accept the bomb if it was ‘”clean” and of a good family’. This is juxtaposed with a child suffering severe retinal burns. The dog-collared interviewee who states that ‘our nuclear weapons will be used with wisdom’ in this ‘war of the just’ is followed by burning families and suffering children. The Sun was appalled: ‘Not an opportunity is missed for a sneer at the Civil Defence or the Church’7. With man-made devastation overpowering nature, religious figures exercise what seems like banal morality as if their time has passed. Most provocative, however, is the criticism of the existing social order implicit in its post-apocalyptic breakdown. Unlike the stoical way the British are supposed to have handled the Blitz (although history tells us of soaring crime rates and class dynamics that problematise the attractively easy myths), here, as in Hiroshima, people become ‘apathetic and profoundly lethargic, people living in their own filth in total dejection and inertia’. Before the bomb falls, a man shows the gun he will use to stop outsiders getting into his shelter (actual advice given by the American government). This every-man-for-himself ideal runs rampant after the bomb falls. There are hunger riots triggered by a food hoarding system for the state’s helpers, and soon the police are murdering, and being murdered, in the streets. Even ‘decent middle-classes’ are seen to ‘develop an attitude of indifference towards the law’, and to indulge in looting, black market and petty theft’, including a housewife dubbed an ‘anti-authority figure’ for her part in a murderous raid on a food control centre. The post-apocalyptic world is a reflection of the tensions at the heart of our society, and the mechanisms used to maintain the seeming naturalness of the unfair distribution of wealth. Filthy children growing up in poverty state their ambitions in life starkly: ‘I don’t want to be nothing’. The idea that the poor will rise up against their rulers is inescapably revolutionary. The police maintain the status quo, but here are ‘normal human beings’ who can ‘go under’ with the mental strain, although those who refuse to help the administration may be shot. On almost the entire subject of thermo-nuclear weapons, on the problems of their possession, on the effects of their use, there is now practically a total silence in the press, in official publications, and on television. As news reports since the 1990s have revealed, this silence covered up narrowly-averted potentially catastrophic nuclear accidents, from an American bomber crashing into a depot containing nuclear devices near Cambridge in 1957 (which could have wiped out most of East Anglia) and the break-up of a bomber over North Carolina which resulted in the release of two 24-megaton nuclear bombs (one of which – hundreds of times more powerful than that dropped on Hiroshima – had suffered failures to five of its six safety devices). At the height of the Cuban missile crisis, the world came close to nuclear annihilation because of a software test, a harmless space satellite and even a bear climbing over a fence in Minnesota… and you thought Stanley Kubrick’s Dr Strangelove, or How I Learned to Stop Worrying and Love the Bomb was silly. Watkins’s fight against the BBC, to gain a film release for The War Game, made it difficult for him to get work in Britain, but he has been making films and television dramas in the subsequent decades. A principled, political and anti-establishment figure, he has been marginalised as a person (caricatured as a paranoid drifter) and even, despite his acknowledged talent, as a director. The underrated if undisciplined parable Privilege (1967) written by Johnny Speight, shows the establishment’s use of a pop star to maintain social control, predicting (at the height of the ‘cultural revolution’) the appropriation of rebellious counter-culture into the mainstream that would recur over the next few decades of popular culture. In the near-decade since I wrote this piece, his mid-period work seems to have been rediscovered by critics to an extent, particularly Punishment Park (1971) and his four-hour production for Norwegian and Swedish television, Edvard Munch (1975). More recent work includes La Commune (2000), a French film utilising techniques comparable with The War Game about the 1871 Commune massacre. Sections from The War Game were broadcast years before the whole play was unbanned. 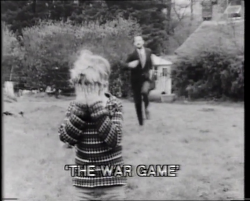 In the 1982 Protest and Survive edition of Open Door, scenes were used to illustrate the argument made by the ‘Schools Against the Bomb’ team.8 The War Game was ultimately shown on BBC2 on 1 August 1985, with an introduction by Ludovic Kennedy, as part of the season ‘After the Bomb’. It fitted in superbly with the Barry Hines-scripted Sheffield-set post-apocalyptic drama Threads (1984), Troy Kennedy Martin’s nuclear-based political thriller serial Edge of Darkness (1986), and elements of Alan Plater’s adaptation of A Very British Coup (1988) directed, like Threads, by Mick Jackson. The ‘After the Bomb’ framing placed The War Game within debate – a separate discussion programme for the whole season followed – just as the American docudrama The Day After had been broadcast on ITV late in 1983 with a framing discussion programme featuring prominent British politicians.9 There was therefore a sense that the time for the debate had come: its broadcast accompanied the escalation of ‘deterrent’ policies following Ronald Reagan’s Strategic Defense Initiative (the ‘Star Wars program’). 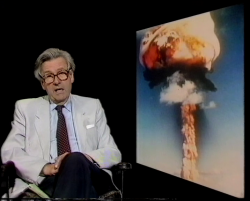 Watkins’s film now seemed uncannily prescient, given that – as Michael Wearing, the producer of Edge of Darkness, argued – ‘the nuclear state is a state-within-a-state, and has grown up without public debate or democratic control’. The War Game was released on DVD by the British Film Institute in 2002 and again on both DVD and blu ray together with Culloden in 2016. You might also be interested in this piece on The Old Men at the Zoo. Originally posted: 30 May 2009. 13 March 2013: added images; minor corrections and tidying. 30 March 2016: added references to, and images from, Open Door and the BBC2 screening of The War Game (both from own collection); added mention of new DVD/BD release.